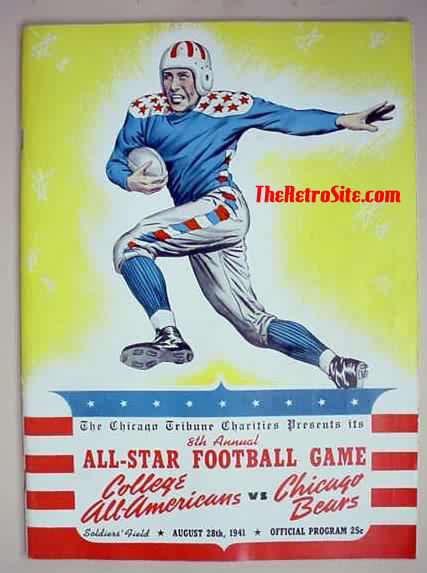 The College All-SChicago Charities tar Game was a preseason football title played annually (except 1974) from 1934 to 1976 between the National Football League champions and a team of star college seniors from the previous year. (There was one exception: The 1935 game involved the 1934 runner-up Chicago Bears instead of the champion New York Giants.) The game originally was a benefit for Chicago-area charities. Except for the 1943 and 1944 games which were held at Northwestern University, the game was always played at Soldier Field in Chicago. The first game, played before a crowd of 79,432 on August 31, 1934, was a scoreless tie between the all-stars and the Chicago Bears. The following year, a game that included future president Gerald Ford, the Bears won, 5-0. The first all-star win was in 1937 for a squad that featured Sammy Baugh. In the 1940s the games were competitive affairs that attracted large crowds to Soldier Field. But as the talent level of pro football improved, the all-stars had diminishing success. The last all-star win came in 1963, when a team coached by legendary quarterback Otto Graham beat the Green Bay Packers 20-17. By the 1970s, crowds for the event were dwindling. In addition, NFL coaches were reluctant to part with their new draftees (who would miss part of training camp) for a meaningless exhibition in which the players might be injured. A players' strike forced the cancellation of the 1974 game. The last game took place in a torrential downpour on July 23, 1976. Despite featuring stars such as Chuck Muncie, Mike Pruitt, Lee Roy Selmon and Jackie Slater, the collegians were hopelessly outclassed by the Pittsburgh Steelers. Pittsburgh was leading 24-0 late in the third quarter when play was suspended due to the awful weather conditions. The game was not restarted. Chicago Tribune Charities Inc., the sponsor of the game, elected not to bring it back for 1977. A program from the 1941 game is shown here. Overall, the NFL teams won 31 of the 42 games. The all-stars won nine. Two games ended in ties. Originally posted on YouRememberThat.com by member Lava1964 on Deceomber 13, 2010.